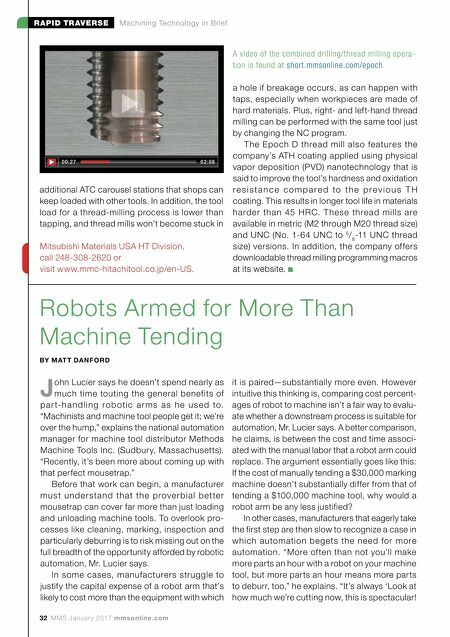 32 MMS January 2017 mmsonline.com RAPID TRAVERSE Machining Technology in Brief additional ATC carousel stations that shops can keep loaded with other tools. In addition, the tool load for a thread-milling process is lower than tapping, and thread mills won't become stuck in 0 0:27 0 2:0 8 A video of the combined drilling/thread milling opera- tion is found at short.mmsonline.com/epoch . Mitsubishi Materials USA HT Division, call 248-308-2620 or visit www.mmc-hitachitool.co.jp/en-US. Robots Armed for More Than Machine Tending BY M AT T DA N FO R D J ohn Lucier says he doesn't spend nearly as much time touting the general benefits of p a r t- h a n d l i n g r o b ot i c a r m s a s h e u s e d to. "Machinists and machine tool people get it; we're over the hump," explains the national automation manager for machine tool distributor Methods Machine Tools Inc. (Sudbury, Massachusetts). "Recently, it's been more about coming up with that perfect mousetrap." Before that work can begin, a manufacturer m u s t u n d e r s t a n d th at th e p rove r b i a l b et te r mousetrap can cover far more than just loading and unloading machine tools. To overlook pro- cesses like cleaning, marking, inspection and particularly deburring is to risk missing out on the full breadth of the opportunity afforded by robotic automation, Mr. Lucier says. In some cases, manufacturers struggle to justify the capital expense of a robot arm that's likely to cost more than the equipment with which it is paired—substantially more even. However intuitive this thinking is, comparing cost percent- ages of robot to machine isn't a fair way to evalu- ate whether a downstream process is suitable for automation, Mr. Lucier says. A better comparison, he claims, is between the cost and time associ- ated with the manual labor that a robot arm could replace. The argument essentially goes like this: If the cost of manually tending a $30,000 marking machine doesn't substantially differ from that of tending a $100,000 machine tool, why would a robot arm be any less justified? In other cases, manufacturers that eagerly take the first step are then slow to recognize a case in which automation begets the need for more automation. "More of ten than not you'll make more parts an hour with a robot on your machine tool, but more parts an hour means more parts to deburr, too," he explains. "It's always 'Look at how much we're cutting now, this is spectacular! a hole if breakage occurs, as can happen with taps, especially when workpieces are made of hard materials. 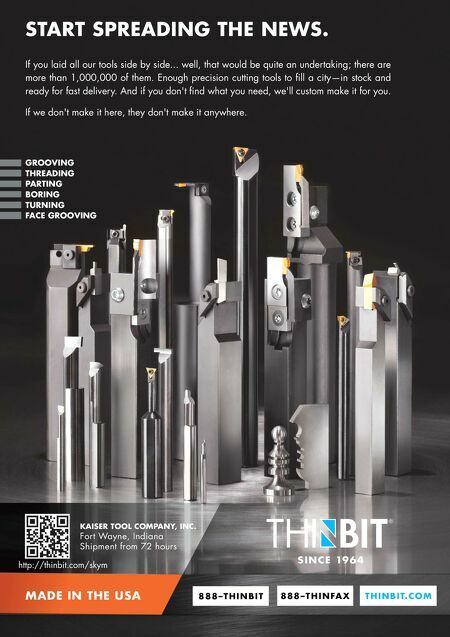 Plus, right- and left-hand thread milling can be performed with the same tool just by changing the NC program. The Epoch D thread mill also features the company's ATH coating applied using physical vapor deposition (PVD) nanotechnology that is said to improve the tool's hardness and oxidation r e s i s t a n c e c o m p a r e d t o t h e p r e v i o u s T H coating. This results in longer tool life in materials harde r than 45 HRC. T he se thre ad mills are available in metric (M2 through M20 thread size) and UNC (No. 1-64 UNC to 5 / 8 -11 UNC thread size) versions. In addition, the company offers downloadable thread milling programming macros at its website.